​Mars Electronics International (the world's leading manufacturer of electronic note acceptors, coin mechanisms, and other unattended transaction systems) - had a challenge and we solved that challenge. Our relationship flourished and we were asked to build additional portals for other divisions. We have a secret for building long term relationships. We do what we say we will do with "No surprises". MEI's many product line sales were customized for each vertical and were hard to manage. We designed and hosting a public website with a secure sales areas. Scott Wheeler, Senior VP of MEI said: "they took hundreds of flyers and converted them into a well-organized web portal that served our sales force very well". Mars Symbioscience acts as an incubator for business ideas generated throughout Mars business segments. 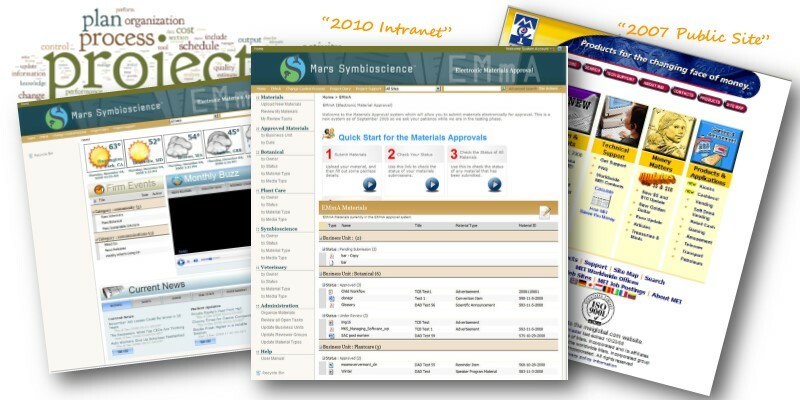 Mars Symbioscience had a need to share information externally and required a document approval process better than email. Additionally, an IT change request process for management of the e-commerce system was desired for best practices. SharePoint infrastructure designed using best practices. EMMA - Electronic Marketing Materials Approval system, a document management review and approval workflow process. IT change control management system. We provided Mars with a new portal that facilitated their marketing document management workflow and a change control management system. Our firm has been providing Microsoft SharePoint consulting services since the first version of SharePoint so contact us today! In that time we've developed many SharePoint navigation apps that will make your SharePoint friendlier and easier for your staff to use. We invite you to learn more about our SharePoint Mega Menus and SimpleTabs as well as our on-demand training system InfoPedia.